I had been saving this bold, orange, polka dot print for something special. Then as time went by, just for something suitable! This lovely Indian cotton, bought for $20 from a designer sale, was looking more and more like it was only suited for a clown outfit. Then, after I made my Wenona shirt, I decided it would be perfect for the Named Wenona shirt dress. To break up the print, I used some orange linen from my stash. I finished this last December and, despite its obvious resemblance to a circus entertainer's outfit, it has grown on me to the point where I actually really like it now. I have even worn it out in public - once (sans red nose of course)! However, while I was making it I went through a bit of an 'I will never wear this' crisis. I experimented with two different dyes on scraps of fabric to try to quieten the deafening orange. 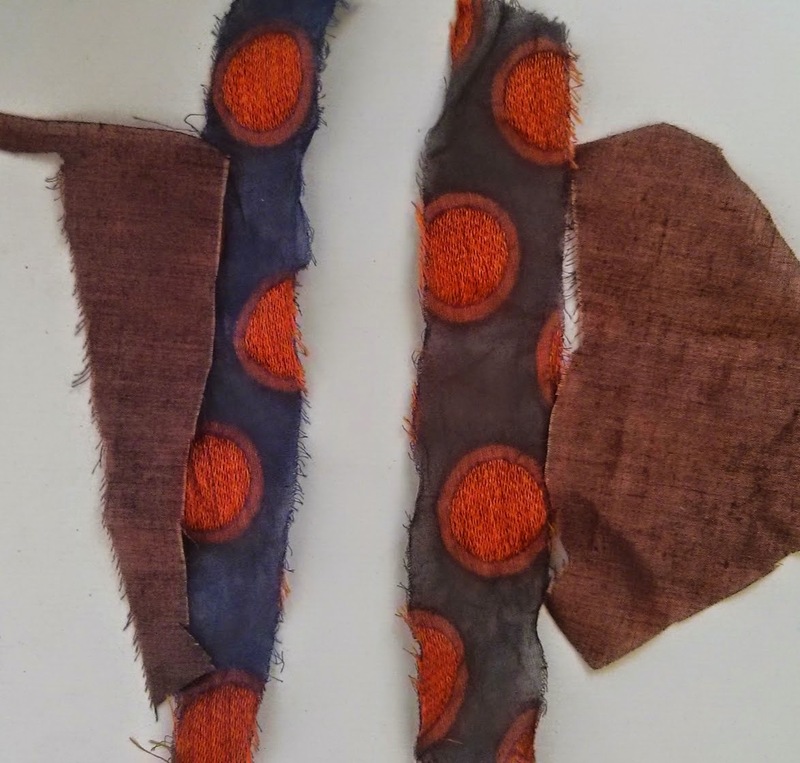 The orange linen and polka dot cotton scraps below were dyed with deep blue (left) and black (right). You will notice that the orange spots have stubbornly refused to back down. Eventually I emailed a trusted sewing friend for assistance. This wise and stylish lady said she liked the playful retro and summery look of the dress. She suggested that I wear it unaltered for a day to see how I felt in it, then perhaps shorten the sleeves or dye it if I thought that would help. This turned out to be excellent advice. As a compromise I shortened my hair, rolled up the sleeves, wore it for a day and suddenly the dress felt OK! I'm leaving it as it is...for now. 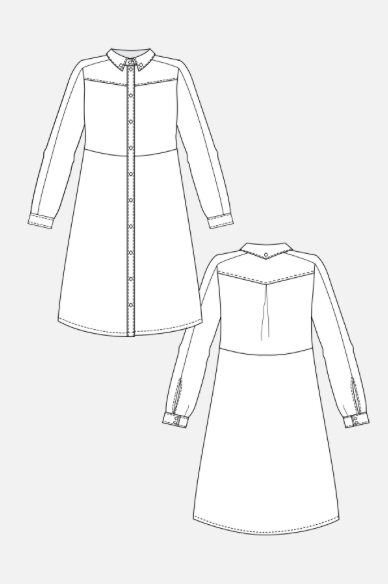 The shirtdress pattern has a seam at the waist for shaping, so looks better with a belt. I like this pattern a lot. It goes together easily and looks very stylish. The hardest part for me was getting the the collar stand perfectly neat and symmetrical inside and outside, but the instructions do help with that. Sewing the rest was straightforward and enjoyable. The stripe down the shoulder and sleeve is one of my favourite things about this pattern. The button at the back of the pointed collar is my other favourite. I used irregularly shaped, black buttons with a white circle on them. I made my usual size 40 in this pattern, but had to take the dress in quite a bit at the sides. Otherwise I didn't make any changes. I've been on a bit of a Wenona bender actually. My, notoriously hard-to-please, sister requested a beach cover-up for Christmas. 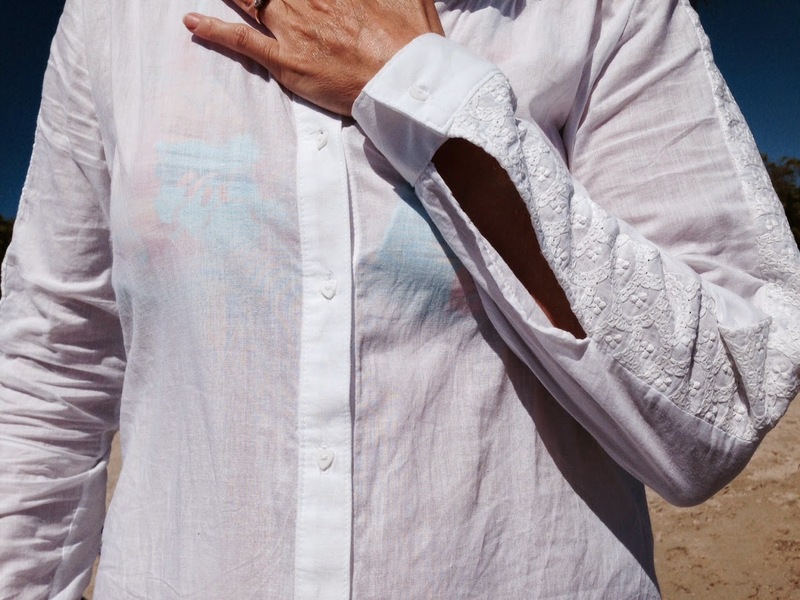 It had to be a sheer, white cotton shirt that was tunic length. 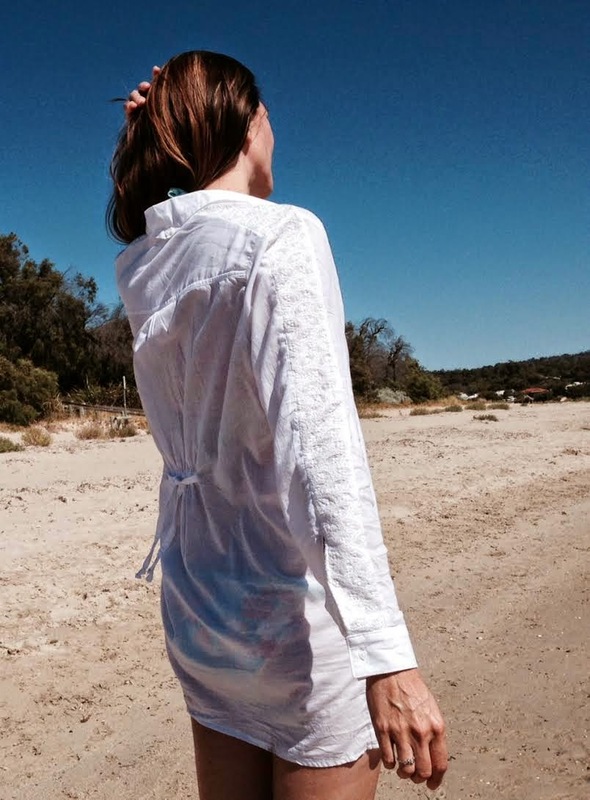 I made her a Wenona in white cotton voile with embroidered cotton sleeve panels. I used the shirt pattern and lengthened it, rather than making the shirt dress. I added a casing and drawstring at the back to gather it in as desired. I love this pattern and have recently made another version, this time sleeveless. I'll save it for another post, this one is long enough already. I adore this dress and am so glad you didn't change the integrity of the fabric's pattern by dyeing it. I am also very taken with your sister's beach top - I could mug her for that one!! The dress is perfect. I love the colour. It makes me want to make one too. I love you in bright, light colours. Especially with the new summer hair. I think it's a really refreshing look on you. But I love your sister's more! The dress is really cute and it looks great on you. This is a nice pattern but your fabric choices are what makes the dress sing! This is so lovely!!! I love both the spotty dress and the white beach cover up. Both look very fresh and summery. That's a great pattern. The contrasting sleeve panel is such an interesting detail. Don't dye it. It's perfect as it is. I love the clown spots! You are a great advert for the named patterns. Oooh, I really, really love this! The colors are perfect as is! I also love the beach version- awesome job! I love the color! I wasn't sure about this pattern for myself but now I really want that beach version! Both are fab! Both versions are great. You've got two fab shirts Meg. I really love this dress - pattern and fabric! I need Wenona in my life! I love the I range and I like the solid with it. 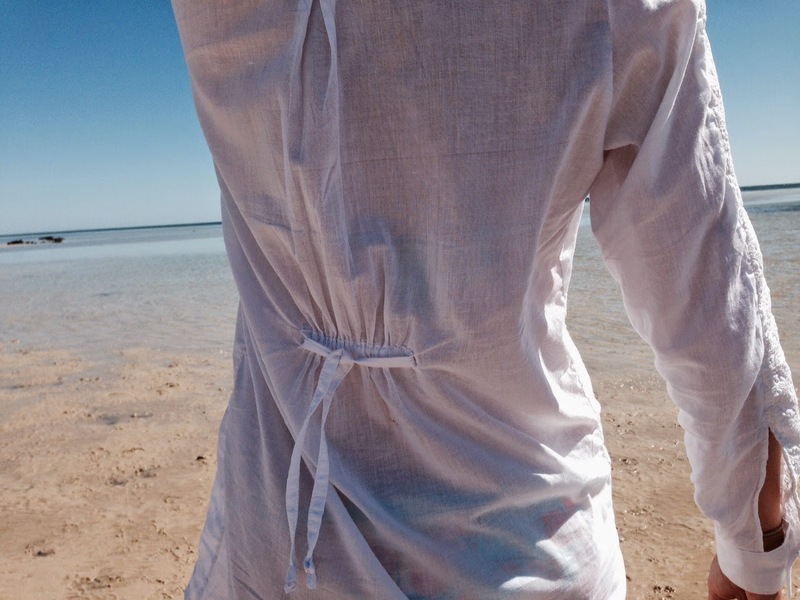 Your shirt dress has turned out lovely. I don't think I'd have give that pattern a second thought if I'd just seen the tech drawing. 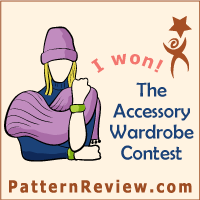 It's great; you're consistently sewing to a great standards (congratulations on your SPR win, by the way). 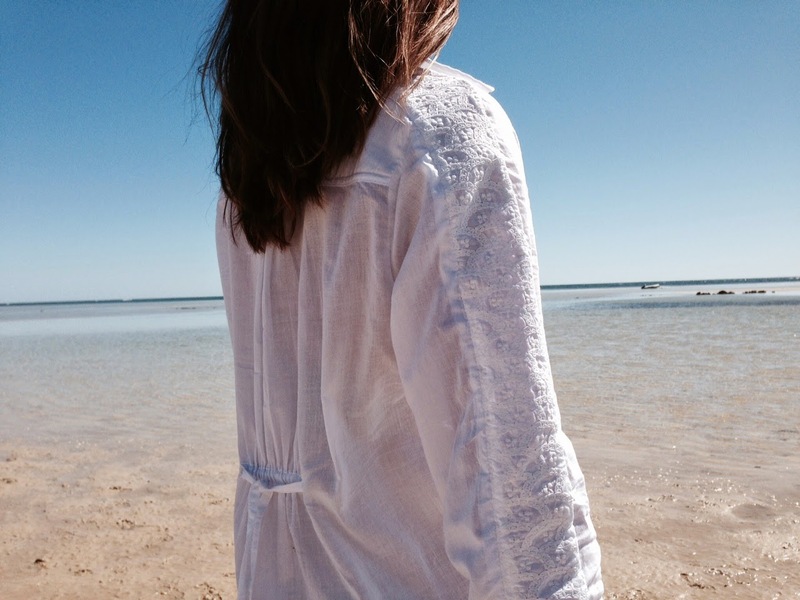 Your sister's shirt should be mass produced and sold for a fortune by the White Company; it's gorgeous. I love the lace and the back detail. That is some beautiful fabric, and it goes so well with the orange linen. I like the fabric and it doesn't look like a clown LOL I do think breaking it up with the orange was a great idea. I'm all about the shirt dresses because of nursing. I need to make one instead of saying I want to! Absolutely love it. I'm making a calendar of dresses and have this pattern in mind for April. Seeing this stunner has consolidated my idea. Wow, I love the white shirt with the sleeve detail - just the thinfg to make it a little bit different! I also like the polka dot dress, but think that I would also have been a bit warey of wearing it!